Say hello to my latest obsession - flats! To be honest, I haven't really ever liked flats up until about a year ago. I thought round-toe ballet flats were often frumpy, and that pointed toe flats would make my already long feet look like flippers! I've found that pointed-toe flats, while they may make your feet look slightly longer, are extremely elongating and slimming! And I don't think there are many of us girls that don't want our legs to look long and lean, am I right? Sometimes they can be uncomfortable, but if you find a well-fitting pair with a bit of 'give,' they're not at all bad once you break them in slightly. Now onto rounded-toe ballet flats... I mentioned above that I used to find them frumpy. But, I think a lot of this is the way they used to be styled, and overall that shoes just weren't as cute when I was in middle school and high school! I've come to realize they're such a classic, elegant shoe and that they're so versatile. I just bought a pair of cognac ballet flats last week and I already know I'll wear them so much. In addition to some of my current favorites above, here are a ton of other options! Price-wise I've picked options ranging from $22 to $100, and most of these come in a few different colors! Those striped flats and the pink and black ones are my favorite!!! I'm don't wear flats too often either, but I think I prefer the pointy toe to the round toe. I don't own any pointy, but they seem much more doable. 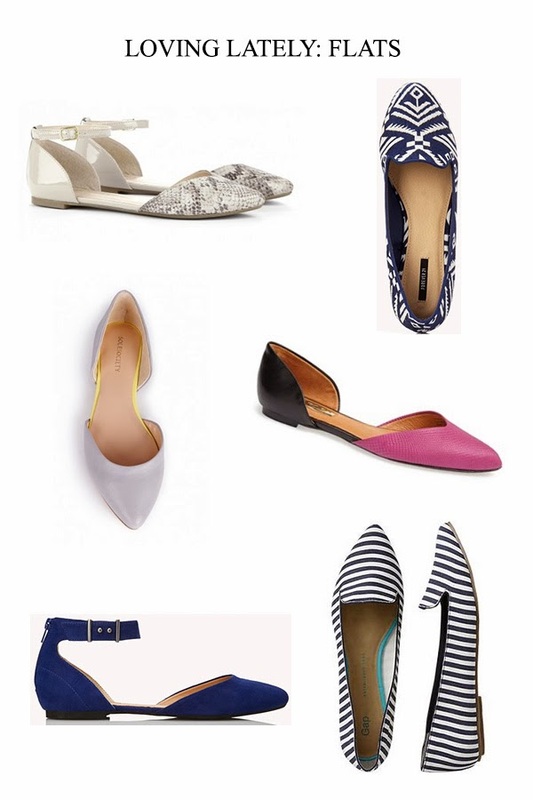 I can't live without flats and these are some stellar pairs, Id wear them all! not only pointed flats but pointed heels make your legs look longer and thinner too! love these! I love D' orsay flats! I'm planning to buy more in different colors! Me too!! I need a pair (or several) of D'Orsay flats.